First, let me preface with I love my babies and they are the most precious things on Earth, but Lord have mercy four months has been an interesting milestone for Hulse and Olivia. They had been doing really great in the eating & sleeping departments and then wham we hit a brick wall. 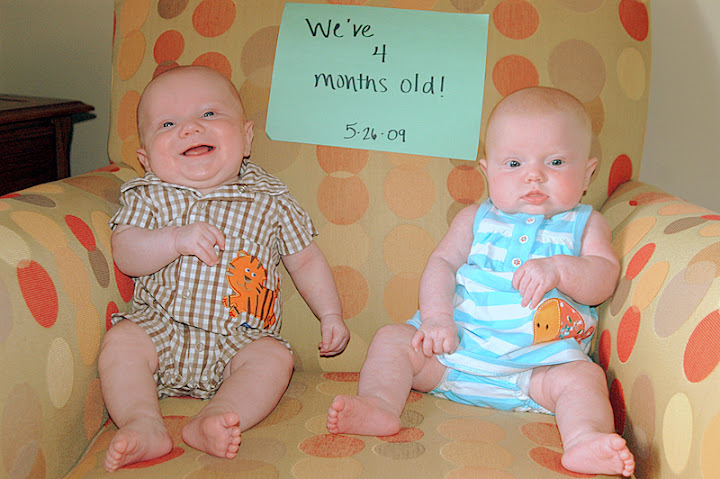 They were eating 6-7 ounces every 4 hours and now we're doing good if they take 4 ounces every three hours. We have been eating off of a spoon, some rice cereal and green peas. They do pretty well with that. It's been frustrating because their bellies aren't getting full then they want to eat more often. Which has led to them waking up one time a night (two on a couple of occasions) starving like they were never going to eat again. Everything I've read/heard says this is normal around this time and is related to a slow down in growth, but nobody has given any advice on how to survive it! I know we're lucky though because a lot of parents I know would love to only get up one time a night with their four-month-old. Of course, we've had a little illness again. Both babies got a little rash and started running fever. It turned out to be just a viral infection (which of course you can do nothing about). Hopefully, we'll be over that soon. In other exciting news, my mom and dad recently sold their house and are planning a move to our area. This is exciting for Trey and I when we need a few more hands on deck. The babies are getting to the age when they're a little easier to handle so we're hoping that GiGi and Pappaw will be able to babysit when they get settled in.